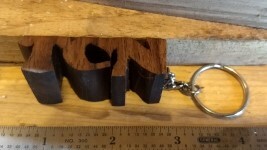 Custom made woodlet keychains - or order as a knick-knack without the keychain. Decide on the word you want and count the number of letters. Do you want a keychain or a knick-knack? Type of wood: Maple is the lightest, next is Oak, and Walnut will be the darkest.